With its vast desert plains and palm groves, Marrakech seems to prevail over all other destinations. There are few places in the world that have so much charm, it’s a kind of “labyrinth Instagram”: wherever we go the opportunity of the perfect photo, to post immediately. After all, does not the red city owe its name to the deep, dusty hues of its innumerable clay walls set up along endless alleys? In addition to the picturesque views, its energy alone is captivating, and the locals have the reputation of being masters in the art of hospitality: this makes it the perfect place to escape, empty your head and find inspiration. Located a little less than two hours from Europe, west of Morocco, the old imperial city has long been a preferred destination for Western tourists who want to go on weekends. Here is a list, not exhaustive, of unavoidable addresses where to stop. Jemaa el Fna is a destination of all enchantment, it is considered as a square that represents the history of Morocco and its present and in the same time subjugating its visitors by its charm starting from the early morning and reaching its peak in the evening. There is no where in Morocco like this wonderful place where you feel easily involved in its atmosphere. By day most of Jemaa el fna square is just a large open space where you find snake charmers, men displaying cures and panacea, others specialised in pulling teeth, and offering to tear off the pain of the outside of the heads of people suffering from toothache. In one of the most beautiful corners of the Medina of Marrakech, behind a beautiful fountain of the 16th century, is a story palace of a thousand and one night. The former residence of the n ° 2 of Marrakech is one of the most beautiful place of the city. Beautiful gardens, a botanical garden and an Islamic garden, two cafes, one with a panoramic view of the rooftops … and a museum on the renovation of the place and the use of water. Human genius in action. Medersa Ben Youssef is a Koranic school founded by the Moroccan monarch Abu el Hassan at the beginning of the 14th century. in 1570 the Medrasa became the largest college in Maghreb, where up to 900 students lived in order to study law and technology, the Moroccan Monarch supported them by providing food and lodging. The Medersa Ben Youssef in 1960 was transformed into a museum, and then since its renovation in 1999 it becomes one of the most popular sites in Marrakech that you should not miss . Moroccan mosques can no longer be visited from Lyautey. You still have to visit the Koranic schools and discover the genius of Moroccan craftsmen there too: Zelligue, carved wood, calligraphy, and it’s bronze door adorned with beautiful cedarwood and mosaic carvings. The Medersa Ben Youssef is the largest in North Africa and the most beautiful example of Arab-Andalusian architecture, an impressive masterpiece of its time. The Museum of Photography was founded with the aim of promoting Morocco its main idea is reaching an audience as wide as possible by presenting very old photographs of the country highlighting its history, traditions and customs. In the Museum of photography we find an impressive collection of photographs generally taken between the nineteenth and twentieth century. while visiting this place you will not only enjoy photographs of breathtaking Moroccan landscapes, but you will also discover on several floors, ancient tourist sites and astonishing traditions. The collections of the house of photography of Marrakech are not limited to photographs, they include also various paper documents such as postcards and digital media to make your visit complete. Perfect combo: Beautiful riad + superb collection + coffee rooftops. You will travel in space and time in search of almost biblical Morocco of the last century. Take the opportunity to lose yourself in the alleys of the medina, one of the best experience of Marrakech. Majorelle Garden and Berber Museum. Do you want to escape from the city’s rush and to spend time in nature without leaving Marrakech ? well Majorelle garden is the best place to do so. Far from souks and buildings this place offers a moment of calm and absolute serenity, in this place all the elements are in perfect harmony with each other providing a unique feeling of freedom and fullness. In the alleys of this beautiful garden, you will stroll among the plants, the basins, the fountains and much more letting yourself be carried far away by natural fragrances and birds singing. First there is this blue majorelle that you will keep in your memory all your life. The art deco villa then and then the botanical garden and especially a museum of ethnology dedicated to Berbers. 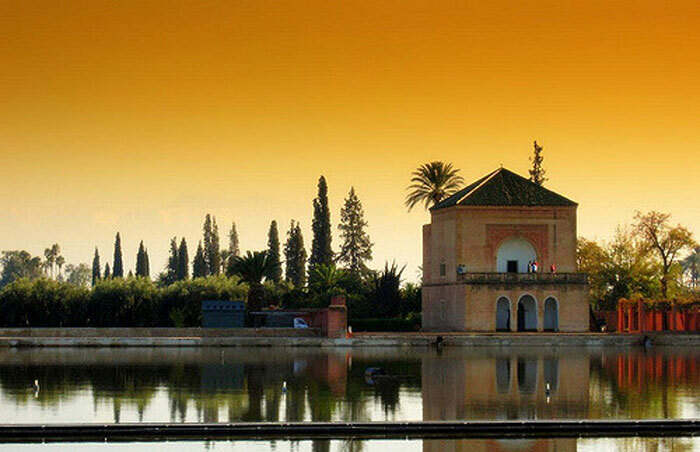 It is one of the most visited and delightful places in Marrakech. On an exhibition surface of 200 m2 the Berber Museum presents more than 600 objects, it is located in the heart of the majorelle garden in the former studio of the painter Jacques Majorelle. In this place we can discover a part of the personal collection of Pierre Bergé and Yves Saint Laurent who was really fascinated by Berber art and culture. Gueliz is designed as the modern district of Marrakech where buildings, wide avenues and crossroads all in a harmony of ocher quite successful. It is the dynamism at every moment of the day, in this place you can find very trendy cafes and very good restaurants, it’s a neighborhood that never sleeps. The district of Gueliz even if it’s outside the walls of the city attract people and tourists thanks to its atmosphere. What to do and what to see in this neighborhood ? The place is famous thanks to its luxury cafes and restaurant, also its luxury shops of international brands in a large shopping center with especially European brands. We give you then an appointment in the western part of Marrakech to discover the life of the Moroccan middle class. You will also be able to eat cheaper than in the tourist restaurants of the medina and also drink alcohol, in addition to delicious squeezed orange juice and mint tea. Here is one of the symbols of Marrakech: A mosque and its sober and elegant minaret. It alone represents the austerity of the dynasties coming from the desert and practicing a rigorous Islam versus those of the north of the country (Fez) more ready to incorporate beliefs outside Islam. 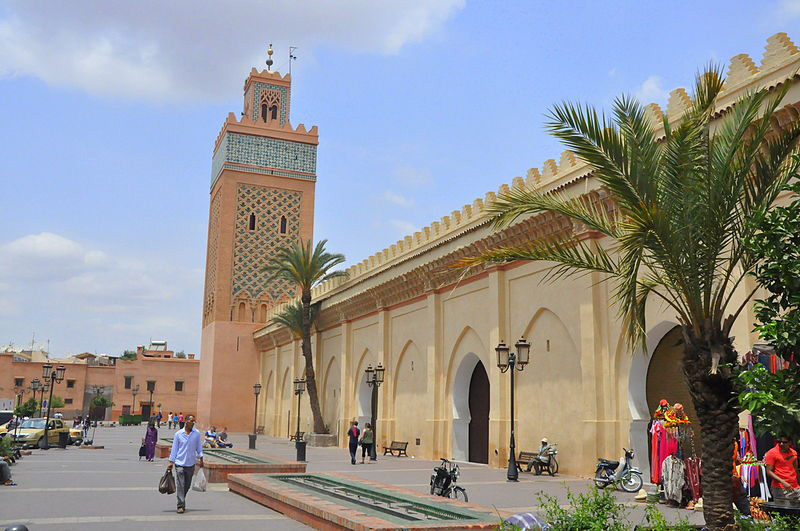 This mosque is one of the best emblematic mosques in Morocco, built by dynasty of Almoravids, this large and beautiful mosque is also called “mosque of Booksellers” it takes this name because it was built on an old souk. It’s minaret is 69 meters high and surmounted by three golden copper balls which is the most decorated element of the Koutoubia. Nowadays, koutoubia still has one of the largest prayer halls in Morocco, it can accommodate up to twenty thousand person. Koutoubia is without a doubt the most famous mosque in Marrakech. The saadian Tombs represents one of the only remains of the Saadian dynasty, why ? In the early 18th century the sultan Moulay Ismail decided to remove all traces of the magnificence of this dynasty by the destruction of all remaining vestiges. However he dared not to commit the sacrilege of destroying their burials. Here you are in the Kasbah (fortress in Arabic) south of the Medina. Many storks take up residence on the local buildings. The Saadians were a powerful dynasty whose burials are remarkably fine. The place is very touristy and a little disappointing. Go deeper into the Kasbah and you will find a nice colorful coffee called Café Clock between street art and traditional pattern, here is a good place to eat a tip. The Badi Palace represents an architectural entity built at the end of the sixteenth century by the Sultan Ahmed al-Mansur Dhahbi in order to celebrate the victory over the Portuguese army in 1578 in the battle of the three kings. Today, in Badi Palace remains a huge esplanade, carved gardens planted with orange trees and surrounded by high walls. Moreover, the Alawite sultan Moulay Ismail took all the richest things in it, in order to build the imperial city of Meknes. To get an idea of ​​the power of Saadians, you must visit their old palace. A gigantic ruin to tell the truth of evocation intact. The impressive palace was moved to Meknes during the change of dynasty. A way to forget the predecessors. A small museum and photo exhibitions are organized. The Bahia palace is not a historical monument like others that populate Marrakech. However this palace is recognized for the richness of its architecture. Constructed recently in the 19th century and inspired by the Arabian and Andalusian styles. The foundation of Bahia palace was under the will of the Vizier Sidi Moussa, who wanted the construction of a luxurious residence for the pleasure of one of his companions, this would provide us an explanation for the name of the monument meaning “palace of the beautiful”. One of the most beautiful and grand palaces of Marrakech. The interior gardens are superb, as are the interior decorations of the ceremonial rooms. A true masterpiece of Moroccan craftsmanship and the former residence of the Protector of Morocco during the colonial period. Return to Jenaa el Fnaa for the discovery of the square in the evening. You can reach the cafe terraces for a panoramic view or stay with the locals who come to enjoy the family show. No place in any city in the world offers such a frenzy every day of the year.